A ubiquitous ingredient in many common household products is being scrutinized by the Food and Drug Administration (FDA) and the Environmental Protection Agency (EPA). The ingredient, triclosan, is a man-made, broad-spectrum antimicrobial agent that is frequently found in antibacterial soaps, cosmetics, toothpastes and mouthwashes, deodorants and first aid products. It is also used as a material preservative in products not regulated by the FDA such as plastic kitchen equipment, clothes, and toys. The FDA has announced that the chemical will undergo further review to evaluate its safety and to see if the chemical poses not just a threat to animal health, as recent studies show, but also a threat to human health. Triclosan may also pose environmental and ecological risks. There are several risks associated with triclosan that are being reviewed by both the FDA and the EPA, who plan to issue results of their study in the spring of 2011. First, animal studies have shown that triclosan alters hormone regulation. Another major concern is the possibility that triclosan use is contributing to increased resistance to antibiotics. Scientists fear that bacteria, exposed over time to products and agents like triclosan through overuse by healthy individuals, will become resistant to antimicrobials, rendering them ineffective to those who need them most: the elderly, sick, and those with compromised immune systems. Similarly, there is a theory about the link between allergies and excessive hygiene; this is based on the idea that through over-cleaning, the body's immune system is never given a chance to kick in and work effectively, thus increasing the incidence of allergies. There are toxicity concerns with triclosan. Triclosan has been linked to dioxin, a potentially carcinogenic substance that can cause health ramifications, particularly with respect to fertility. When exposed to light, triclosan becomes more dangerous; sunlight converts the triclosan to a toxic form of dioxin. The EPA is also examining environmental and ecological risks of triclosan. Since it is the active ingredient in many soaps, triclosan is washed down the drain and eventually ends up in the water supply. There is sufficient evidence that triclosan is being found in streams and waterways, and that it can have detrimental effects on ecosystems and aquatic organisms like algae. According to water testing studies triclosan is among the top ten contaminants in U.S. streams, rivers, lakes and aquifers. There are thousands of products that contain triclosan. A few are: Dial® Liquid Soap, Softsoap® Antibacterial Liquid Hand Soap, Clearasil® Daily Face Wash, Colgate® Total, Reach® Antibacterial Toothbrush,Right Guard Sport Deodorant, Aveeno Therapeutic Shave Gel, Solarcaine® First Aid Medicated Spray, Teva® sandals, Merrell shoes, Thomasville® furniture. A complete list contains many other products and toys. On its website the FDA states that triclosan is "not known to be hazardous to humans," citing that there is insufficient safety evidence to warrant any change in consumer use. However, the federal agency also states that there is not enough evidence to prove that antibacterial soaps which contain triclosan provide a greater benefit than plain old soap and water. Furthermore, the EPA states on its "Triclosan Facts" page that "due to the rapidly developing scientific database for triclosan," the Agency will accelerate the process of re-registration (the process of registering chemicals to ensure they meet the more stringent standards of today) of the chemical, and will begin the review process in 2013, ten years ahead of schedule. 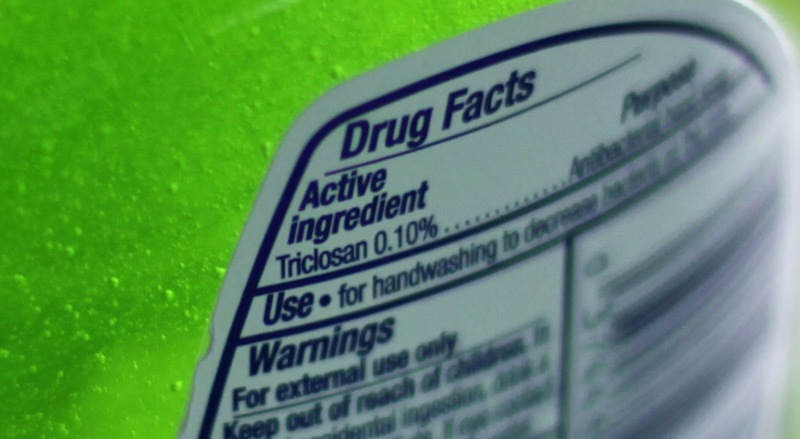 Until further studies are undertaken on the possible health effects of triclosan, consumers may opt to avoid the chemical. Since triclosan is regulated by the FDA in consumer products like soaps and toothpastes, it is easy to read the product's "Drug Facts" label to determine if the chemical is listed as an active ingredient. Some toothpaste manufacturers, like Tom's of Maine, actually advertise that they do not contain triclosan. As with any product used by consumers today, it's prudent to read labels, and keep up with health updates.